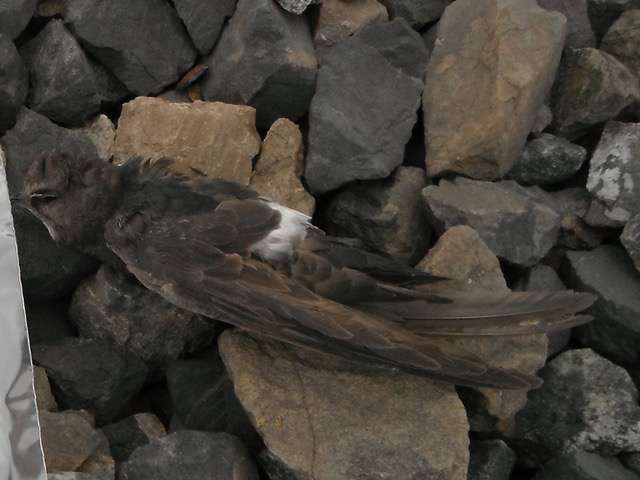 This is the well preserved but near-emaciated carcass of a House Swift was discovered in 2012 near the Deltaport container terminal, just 40 meters from the Pacific Ocean. Credit: Kimberly Walters. Zoologists have documented the first record of a House Swift in the Americas—and begun to unravel the mystery of how the tiny bird got from its south-east Asia breeding grounds to Ladner, BC. The bird's well preserved but near-emaciated carcass was discovered in May 2012 near the Deltaport container terminal, just 40 metres from the Pacific Ocean. "Like some marathon runners, I think this fellow finally saw land and just crashed, exhausted, at the finish line," says Ildiko Szabo, a curator at the Beaty Biodiversity Museum and forensic ornithologist at the University of British Columbia (UBC) who led the identification of the specimen. "These birds are amazing fliers and can stay airborne for months at a time, but there wouldn't have been enough insect prey to sustain him properly over the mid-Pacific. The mystery is what sent him so far off course." In a paper published today in the Wilson Journal of Ornithology, Szabo and co-authors, including UBC researcher Darren Irwin, propose that either a storm set the bird off course, or even more likely, his internal navigation 'compass' malfunctioned. "Our initial reaction was skepticism that this would be such an unusual species," says Irwin, who studies how new bird species arise. "But by combining a review of the bird's characteristics with DNA testing, we were able to confirm that this was indeed a House Swift from Asia, making this an exceptional case of vagrancy." Beaty Biodiversity Museum curator and forensic ornithologist Ildiko Szabo discusses the case of a House Swift that ranged across the Pacific from Asian to Ladner, British Columbia. Credit: University of British Columbia. The prospect of the bird hitching a ride by ship or plane is unlikely, say the authors. Swifts don't typically roost on ships, and the bird would have needed to be airborne to feed over at least portions of the journey. The near perfect condition of the swift's feathers also indicates it wasn't trapped in a plane's wheel well. There were no indications of trauma, parasites, disease or oiling. But the 13-centimetre swift was very underweight, and had entirely depleted its fat stores. House swifts (Apus nipalensis) range west to Bhutan, and as far east as Honshu Island, Japan. And until now, this species had never been found in the Americas. Other swift species from Asia have reached the Alaskan islands, and European swifts have occasionally successfully completed Atlantic crossings. The discovery is likely to excite birdwatchers and cause a cascade of bird list updates—the species needs to be added to the Greater Vancouver Area, British Columbia, Canadian and American Birders Association Area bird lists. The specimen is currently on display at the Beaty Biodiversity Museum, Vancouver's natural history museum.